Failure to understand the nature of change in business or politics leads to defeat, perhaps disaster. There are countless stories from the experience of the news media over the past two decades which bear witness to this. Technology has changed so many aspects of economic activity. Newspapers have suffered especially. Their two traditional forms of revenue – sales and advertising – no longer deliver anything like they once did. Yet, despite their falling circulations, their political influence –real or imagined – has held up, particularly with older readers. In Britain, by tradition and regulation, the broadcast news media are supposed to strive for impartiality. It is across the editorial pages of the printed press that opinionated political journalism is allowed to run wild. What the proprietorship of these papers is aiming at is power, but power without responsibility – the prerogative of the harlot through the ages. Any prime minister since would probably agree. When that power, though, is allied to a political cause it favours, it has often been seen as decisive. Seeking to win an election for Labour in the 1990s, after almost two decades of Conservative government, Tony Blair famously flew half way around the world to meet Rupert Murdoch. Conventional wisdom ever since has held that you cannot win a UK election if Murdoch’s papers don’t back you. Journalism department seminar discussions often revolve around the real nature of Murdoch’s influence. Does he deliver votes, or are he and his editors just really good at guessing who will win, and picking that side to boost sales? To an extent, though, this is beside the point. If politicians believe in the power of the press, then, in that sense at least, it is real. Politicians’ choices have reflected the way the world has changed. David Cameron’s choice of Craig Oliver – a former TV news editor – to head his communications team in 2011 was cited as an example of Fleet Street’s waning importance. All the same, it was the influence of the Daily Mail that reportedly came to worry Cameron in the run up to last year’s EU referendum. Reports earlier this year suggested that Cameron had tried to get the paper’s editor, Paul Dacre, sacked over his backing of Brexit. But his successor in Number 10 has now learned that the support of Fleet Street’s big battalions was not enough. Despite the combination of their support for May and their rubbishing (literally, in the case of The Sun) of Corbyn, the Conservatives fell short of an overall majority. 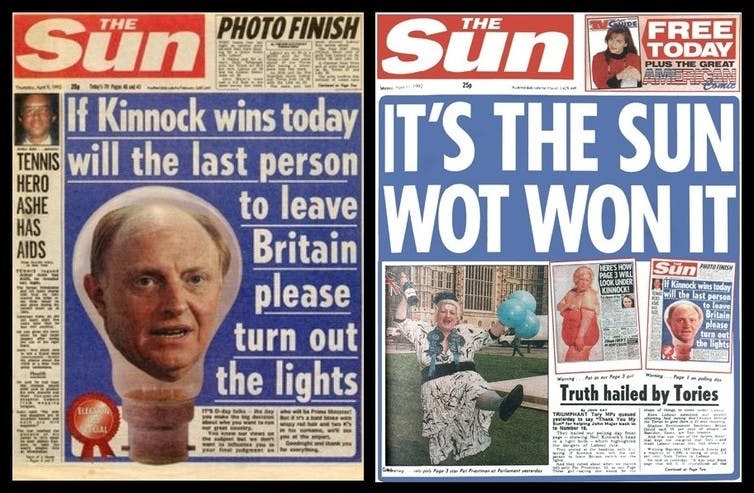 In an age when so much more opinion is shared on social media, 2017 may well come to be seen as the election which ended the “Sun wot won it” era.